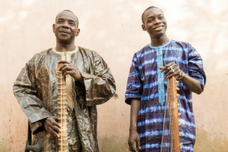 Malian virtuoso and two-time GRAMMY winner Toumani Diabaté marked the thirtieth year of his recording career in 2017, a benchmark for one of the world's most remarkable musicians. The master of the wonderfully hypnotic twenty-one-string kora, Diabaté represents the seventy-first generation in a line of West African griots that stretches back seven centuries. Known for his ability to beautifully render melody, rhythm, and bass simultaneously, he has collaborated with Björk, Herbie Hancock, and Béla Fleck; exposed international audiences to the kora's mesmerizing melodies; and advocated for compassion for his country. In fact, the current crisis and conflict in Mali, which has included a jihadist takeover and a military coup, prompted Toumani to recruit his son, the Malian hip-hop star Sidiki, to record an album of kora duets in 2014. An approachable listen that digs back into the kora tradition with bold renditions of songs excavated from obscure field recordings, Toumani & Sidiki earned unanimously ecstatic praise. Described by The Guardian as the best collaboration of Toumani's career since his groundbreaking work with Ali Farka Touré and by NPR as "magical," it is a joyous document of one of music's ancient traditions made new.